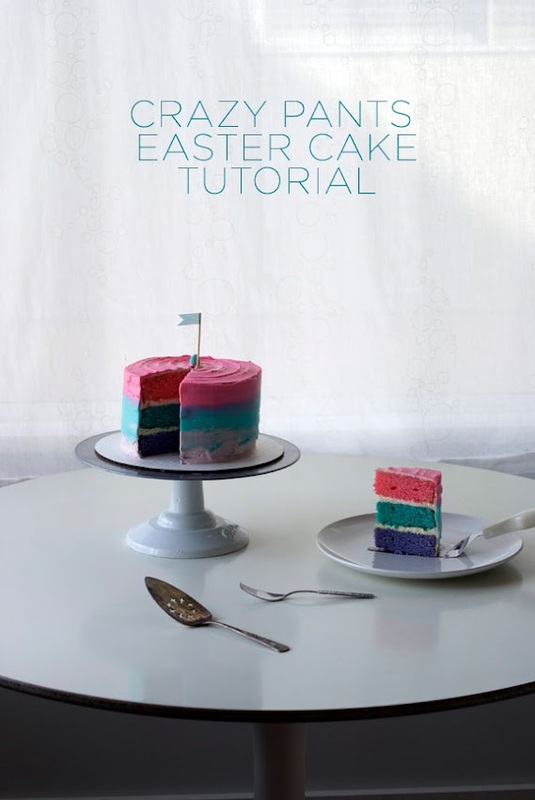 Pretty Tri-Coloured Easter Cake & Tutorial! 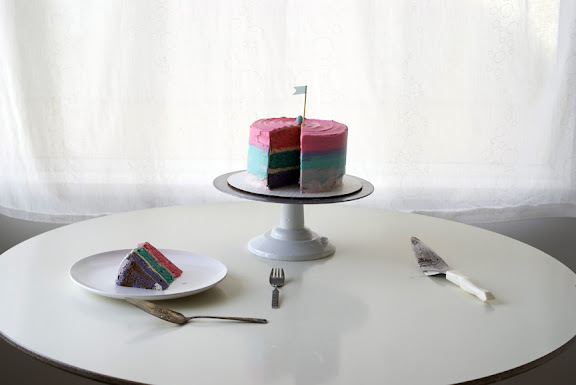 This cake was inspired by my sweet cake pal Rosie at Sweetapolita – I recently watched her pastel swirl cake tutorial and was like, “I would like to try that!! !” So here ya go. My cake is much more… “rustic” looking than hers, as she is the MASTER! 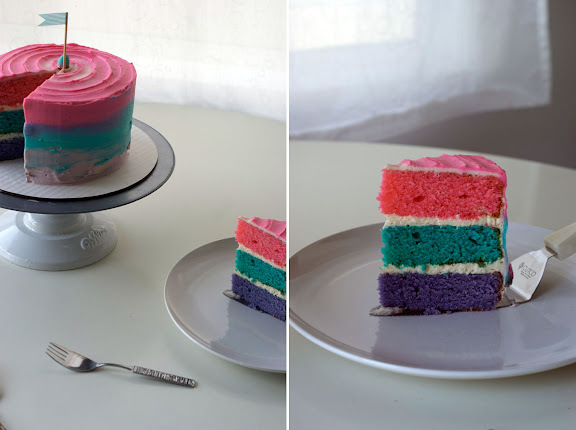 And my colours turned out way more vibrant than I had intended… I really thought I was going to make a pastel Easter cake… instead it turned out to be a little on the “crazy pants” side… hence the name. 3. 4 cups of vanilla buttercream. This recipe by Sweetapolita will do great! 4. Three types of gel food colouring: I used Wilton brand gel colour in Violet, Sky Blue and Fuchsia. 5. 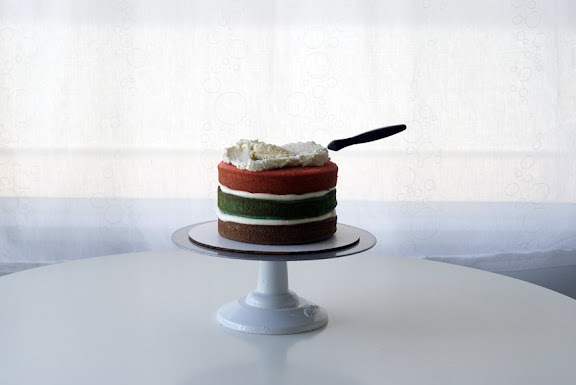 An offset spatula to frost your cake with! 8. 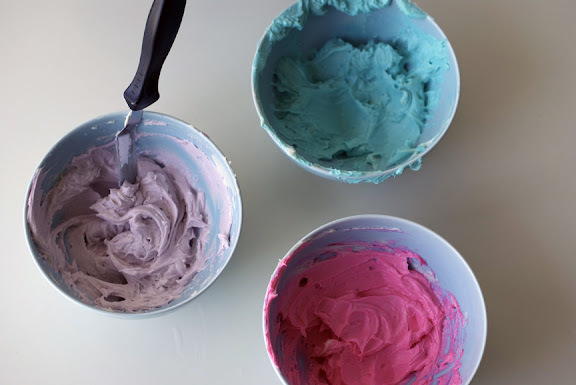 Three medium sized bowls to mix colour into your cake batter, and into your buttercream. 9. A bench scraper to smooth and blend the sides of your cake – or you can use an offset spatula. Once you have your cake batter prepared, divide it evenly into three bowls. 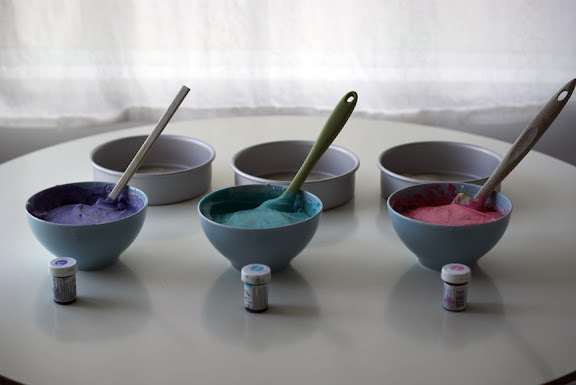 Put a teensy bit of gel food colour in each bowl – you can start with less then add more if need be. Mix gently to blend using a spatula or spoon. 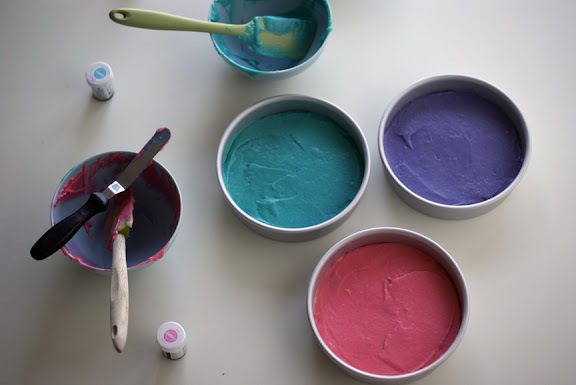 Place coloured cake batter into your 7 x 2 inch cake pans. You can smooth out the top with an offset spatula to even it out in the pan if you like. Place in oven and bake according to recipe’s instructions. Once your cake layers are baked and cooled, using a serrated knife, level your cake layers so they’re flat. 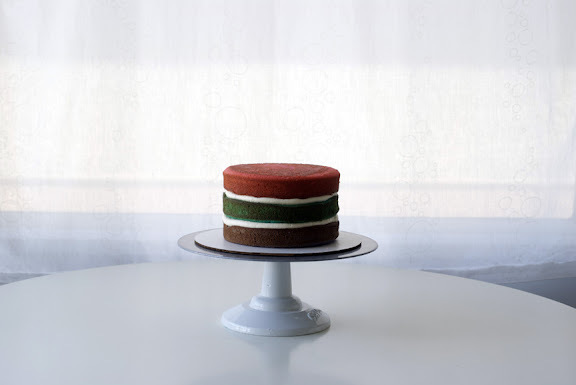 Then, begin to layer your cake using the vanilla untinted buttercream frosting! 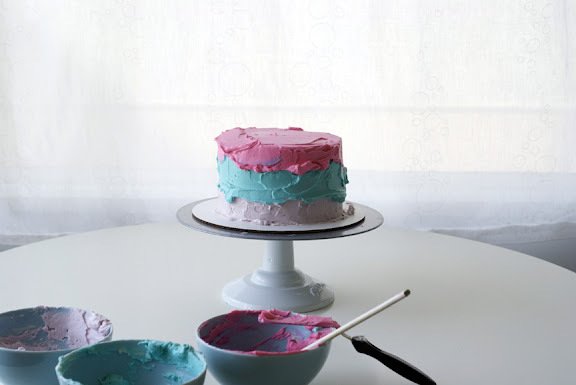 Divide the frosting in half and use the first half for filling and crumb-coating your cake. 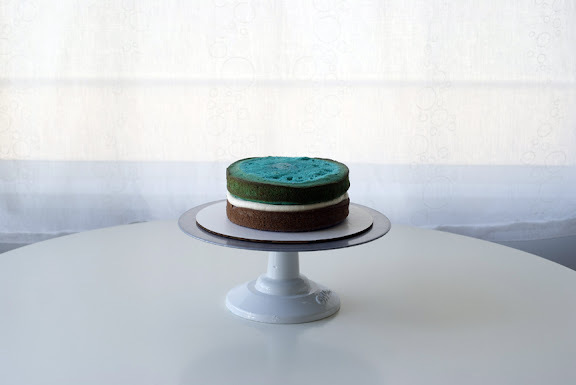 I used a piping bag fitted with an open circle tip to create an easy and even layer of frosting, but you can easily just use an offset spatula or even a regular old butter knife to fill your cake with. I layered mine with the purple on the bottom, blue in the middle and pink on top… looks like a cute little hamburger now, doesn’t it!? Time for the crumb coat! This is the frosting layer that seals in those pesky crumbs. All done! Totally ugly here but not a big deal! At this point I place it in the freezer for the crumb coat to set, about 10-15 minutes. Now time to mix the remaining half of buttercream into three different colours. Again, I went with purple, blue and pink! Easter! Bring your chilled cake out of the freezer. Now time to frost the colours! I started at the bottom with my offset spatula, frosting on the purple. 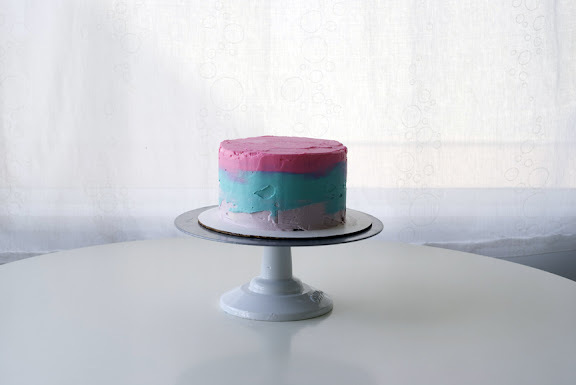 Then I frosted on a layer of the blue – then I started from the top with the pink and will connect the pink and blue. 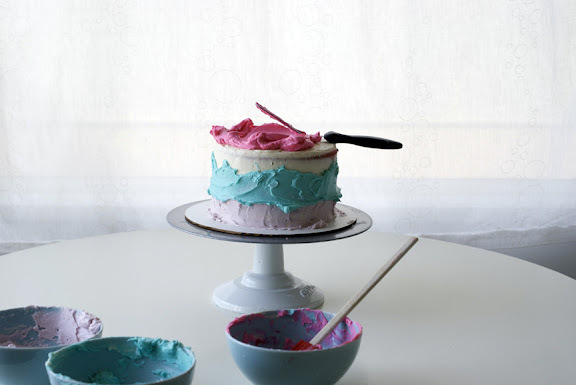 Taking your bench scraper or your offset spatula, smooth all around the cake, combining the colours while you smooth it. Okay, “smooth” is a loose term with this cake! “Smear”?? But look! Even with not the very best colour-combining and smoothing job, cake looks so cute and festive and colourful!!! 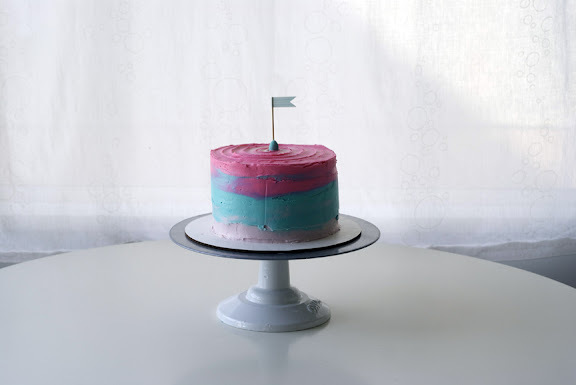 I used my offset spatula to create a little swirly effect on the top of the cake. Add a little candy chocolate egg and a matching cute flag and you are ready to PARTY! Slice it out… don’t be shy! Get your fork ready, too and call your buddies to the table. Eeks! 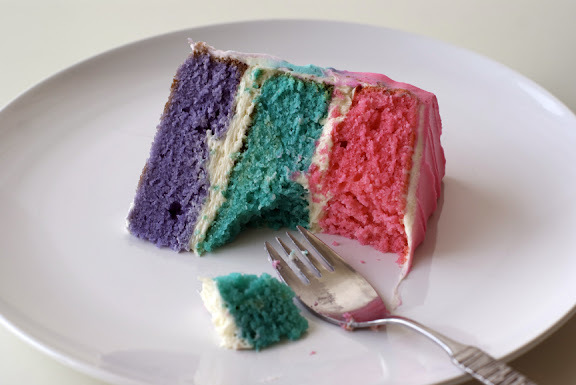 Then freak out at how mini-exciting it is to see the insides of a multi-coloured cake! Take even MORE pictures with a slightly different set-up! 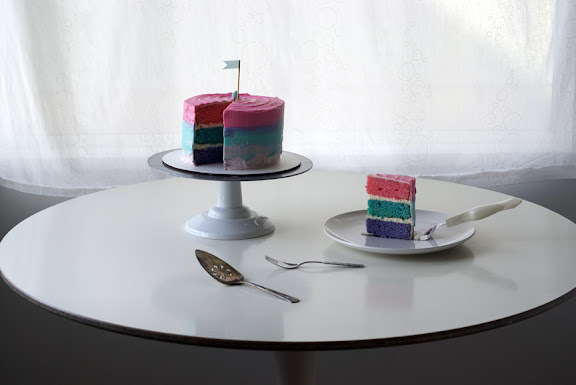 Cake photography nerd! Then… your work is done… you may eat your slice now… chomp chomp…! Hope you enjoyed this tutorial, blog buddies! Happy cakeing to all! Ok this is AMAZING Coco Cake! Love it! 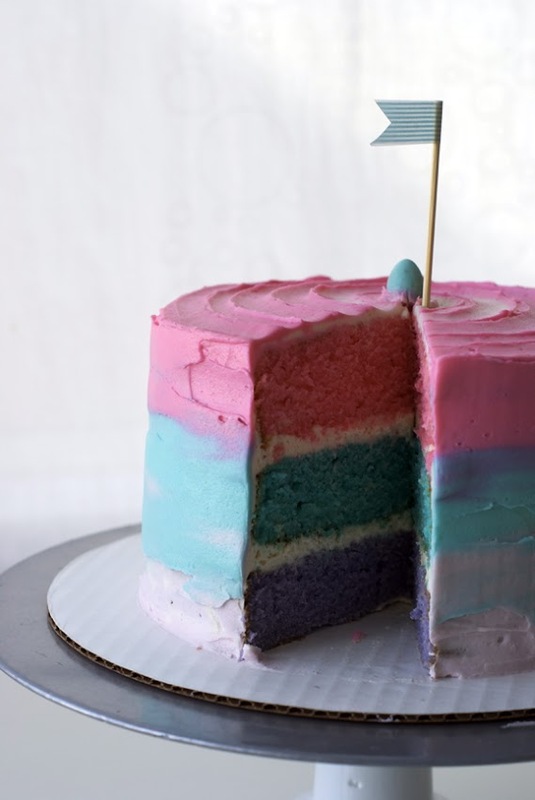 What a eautiful cake! I look forward to following your blog. What a beautiful cake! I look forward to following your blog! Wow that looks so awesome!!!!! I can’t stop staring at it!